Who are the people who design the series of state quarters? Who actually approves the final designs? And what are these morons thinking? I mean, these things get uglier and more stupid with every issue. Case in point: today I received a shiny new quarter in change. I checked it out to see what it was. Oh, cool, California! Now, if you were going to design images to visually represent California, what would you choose? Let's see, California is "The Golden State," so perhaps I'd have the Golden Gate Bridge; and a Forty-Niner panning for gold in a creek; or a cable car; or, maybe, the Hollywood sign, or a cameraman cranking a movie camera. Perhaps I'd have the mission at Capistrano with the swallows returning. Maybe even a giant Redwood tree. Instead, there's some kind of bird -- an eagle, I guess. A big blob that might be a rock. And a guy with a hat and a cane. Are any of these images immediately recognizable; do any of them instantly call to mind "California"? NO! That's why they actually had to label the things, so people could tell what they are! The blobby rock thing is supposed to be Yosemite Valley, so it says. The guy with the cane is John Muir. Didn't his wife have something going on with a ghost or something? What's that got to do with California? Oh, wait, it's the naturalist guy. I knew that. 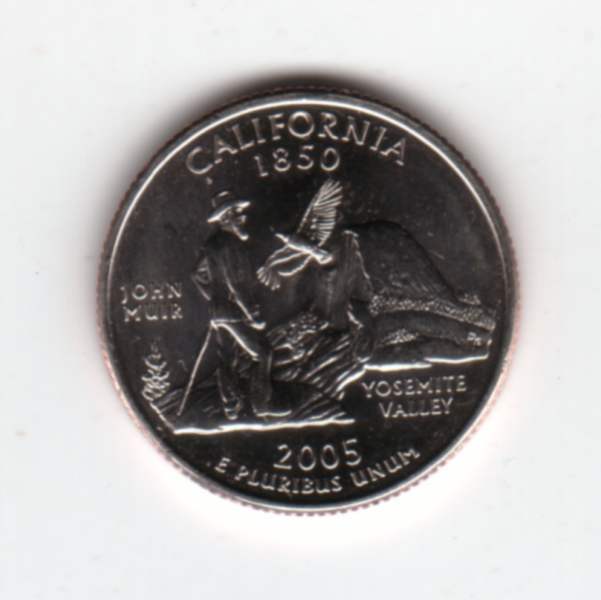 But I sure wouldn't have known it by looking at the pathetic little image on this stupid coin. I still don't get the bird -- it's not labelled. Maybe it's a California Condor, huh? Does any one of these images, alone, immediately, or even with considerable thought, bring to mind "California?" Do all of these images together represent, to the casual observer, the idea of California? How about the Cliff House? An orange grove? An oil well? The Santa Monica Beach boardwalk? I've been pretty disappointed in a number of the state quarters, but this one rivals that "Old Man of the Mountain" thing for pure ugly and dumb.